Our South Brunswick employment lawyers represent employees in all areas of employment law throughout the state of New Jersey. The South Brunswick sexual harassment lawyers of Smith Eibeler represent residents and individuals who work in South Brunswick and Middlesex County in claims of Sexual Harassment, Discrimination, race discrimination, national origin discrimination, Pregnancy Discrimination, reasonable accommodations, severance agreements, and wage payment violations. Our law firm is located in Monmouth County at the Bell Works building in Holmdel, New Jersey. South Brunswick is a municipality within Middlesex County, which is located in central New Jersey. South Brunswick is bordered to the north by Highland Park and Piscataway, to the west by East Brunswick, to the south by North Brunswick, and to the east by Somerset County. South Brunswick has a total area of 41.039 square miles, which includes 0.391 square miles of water. The town is home to several large parks, including Rowland Park, Woodlot Park, Sondek Park, Reichler Park, and Beech Woods Park. Pigeon Swamp State Park is an undeveloped state park located in the town, and was declared a National Natural Landmark in 1976. South Brunswick was established in 1798. According to the 2010 Census, there are now 43,417 people, with 11,694 families, living in the town. The median age of South Brunswick residents is 38.6 years old, and in 2010, the median income of South Brunswick households was $100,950. Various employers in South Brunswick include Tris Pharma, Guardian Drug Company, Limbach Company LLC, Nuvida Plastic Technology Inc, and Mincing Trading Corporation. 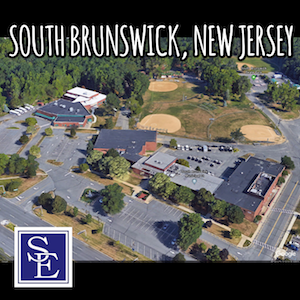 South Brunswick is home to both public and private schools. Elementary schools in South Brunswick include Brooks Crossing Elementary School, Brunswick Acres Elementary School, Constable Elementary School, and Indian Fields Elementary School. Crossroads Middle School North and South are the town’s middle schools. South Brunswick High School is the town’s public high school. Private schools in the town include St. Augustine of Canterbury School. Institutions of higher education in the area include Rutgers University and Middlesex County College. Famous persons who live or have lived in South Brunswick include Mike Elko, Donald Fagen, Ed Morn, and Steven Portnoy. Restaurants in South Brunswick include Dou Oven, Osteria Procaccini, and Eno Terra Restaurant & Enoteca. South Brunswick was named the 22nd “Best Places to Live” by CNNMoney.com, and SafeWise ranked the town as the 10th safest city in America to raise a child. The Municipal Court of South Brunswick is located at 540 Ridge Road, Monmouth Junction, New Jersey. Our New Jersey employment lawyers can file a lawsuit and have it properly venued in Middlesex County Superior Court if one of the parties lives in Middlesex County or if the employer regularly conducts business within the county. Should you or a family member have an employment related legal issue and are in need of a South Brunswick employment lawyer, please call our office today to discuss the facts and circumstances of your employment related legal issue.